This post was actually called ‘Slow travel and the rise of the travel flâneur’, but I shortened it a bit. What is this post about? Well, it talks about how you can improve your travel experience by adopting a different travel style. As many of you know, improving travel experiences is one of my favorite subjects! Hopefully you like to read about it too…but I trust you do. Otherwise you would have unsubscribed to this silly travel blog already long time ago! The Act of Silly Traveling. How does that sound by the way? It lightens things up, doesn’t it? There is no need to be that serious about traveling all the time, is there? And if you agree to that, let’s lighten things up a bit more by introducing a new (kind of silly) person. You know I write a lot on this blog about why we travel and the role of serendipity. In this post all comes together in the birth and rise of a new traveler: the travel flâneur. Wait, let’s explain something else first: slow travel. The concept of slow travel is not only about slooooow physical movement from one place to another, it’s more than that. Slow travel is about consciously spending more time in a place than you would normally do. Reasons are diverse, but slow travel is a state of mind which allows travelers to engage more fully with communities along their travel route, favouring visits to spots enjoyed by locals rather than merely following the travel guidebooks. Discovering new things, just by being there. Slow travelers embrace serendipity, the act of unexpected discovery. Being an active serendipity pursuer means that you are open to find something that you didn’t know you were even looking for. And yes, now we come to the flâneur, someone who actually made a habit out of finding unexpected discoveries….want to meet him? A flâneur is someone who walks the city in order to experience it. Someone who wanders the streets, not with the intent of getting somewhere, but as an observer and philosopher. In that way, flâneurs cultivate serendipity. The flâneur is a classical figure popularized by the poet Baudelaire in the 19th century. But the flâneur is not only a classical figure walking the city streets. The flâneur is the one who understands urban phenomena and cultural diversity. They immerse themselves in the metropolis and play a key role in understanding and portraying a city (and its people). Today street photographers are seen as a modern extension of the flâneur, as they actively observe the urban life. I want to introduce another extension of the classical flâneur: the travel flâneur! Do you see how slow travel and being a travel flâneur can turn out to be a great combination? How would that work in practice? When you travel and stay in a place for a longer period of time you will get more grip on local life. Stroll the streets of your travel destination and plan one week instead of 2 days. Learn about the local habits and about the people. Observe, find what you were not actively looking for and get a better understanding of the cultural diversity. But there is more. Slow travel and acting as a travel flâneur is a way to beat cultural flattening. Just like carbon emissions and the demand for a sustainable future, cultural flattening is a motivator to travel differently, more consciously . I don’t write about eco-tourism or green travel, but I do write about slow travel and how to improve your travel experience by focusing on unhurried, low-impact journeys. No more stereotype propaganda by jumping in and out a place quickly, but full attention to the cultural wealth and our responsibility to respect and keep cultural differences alive. Please let me be a travel flâneur! 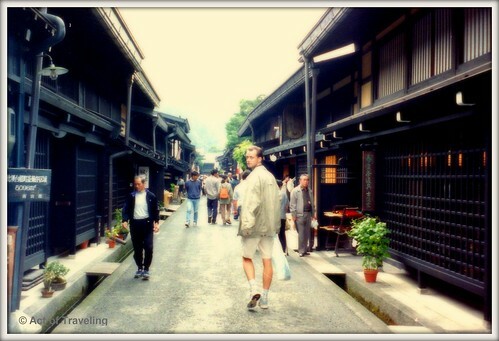 Urban or village life, when traveling slowly let me immerse into another culture. Observe and embrace it. Just be there. You can call me silly, naive or a sentimental idiot (ok, I am), but our upcoming 6 weeks of slow travel will ignite the travel flâneur inside of me! Walking the streets, observing and cultivating serendipity to discover phenomena. Think smart, travel slow. I even expect my blogging to become different. Silly? Maybe, but the travel blogger will evolve to become the new travel flâneur. I almost forgot the bonus! I want to end this post with a poem called ‘Secrets of Travel’. This post was inspired by Fabian Kruse. YES! Great post. I agree about traveling slower and allowing time to just take in a place. There is so much to see and many things we miss when we’re constantly “on the go” and checking off places to see! By my 2nd week, many travelers couldn’t comprehend, just exactly I was doing there for so long? What is there to see? Because you can “see” everything in a day or two! But I loved just spending time with the staff at the guest house who became my friends, watching the town begin in the morning, learning the quirks of the town and how information spread. I just enjoyed the moments. It was my first awareness of how important just taking time for myself and taking time to appreciate a place is. Wonderful Lauren, this is exactly what I believe slow travel is all about!! I’m sorry for this delayed response, but for whatever reason I didn’t notice it earlier. I think you can indeed just enjoy all the tourists coming into the town of Moshi and leaving again, and new ones coming in and leaving again..and again. Then it’s great to be part of the community actually living there: watching the world pass by, again and again. Great comment, thanks! Thank you for constantly bringing me back to this topic of slow travel… or being a travel flâneur. Actually, I think the term silly travel is just perfect. Let’s go with that. Love your analogy of culture flattening. Thanks Clark. I have to be honest that I think I missed the last comments on this post. But anyway, I read it now! ……and I advocate for super slow travel! If you can, why stop at a week? If you are able and find an opportunity that allows you to do so, stay awhile, live abroad, work or volunteer abroad…..
I’m in! Label me a travel flaneur. Great post Emiel! I’m really looking forward to your travels! I actually love to fancy myself as a 19th century flaneur. I always find serendipity in your words as I wander through digital space. I hear the call here. Inspiring. I went to Paris a couple of years ago, and not knowing how silly my plans were, I decided to explore all the arrondissements in counter-clockwise fashion in a week’s span. Ambitious I was. Overwhelmed with walking, sensing, and each time I thought I wanted to give up, beauty did not fail me. Unforgettable. I love slow travel. Count me in in the evolution! Here’s to a new hybrid of travel flaneurs! Paris was (maybe still is) called Flâneur’s Paradise? Paris is where it all started. Thanks for sharing that serendipity story. “the travel flâneur”–i love this. I was thinking about howm uch richer my cross-cultural experiences are when I observe the verbal (and non-verbal) texts. People are dynamic–at once individual, cultural, and universal. I had the opportunity to immerse myself in a retreat that was entirely Brazilian; I learned more in two SLOW weeks than I could have learned in a semester in language and culture classes. Great post, Emiel. Thanks Mark. Sometimes you need to move away from your Shire to experience SLOW. Times when watches are irrelevant are the best. Great post you just published about The land Beyond Space.